@Karlhungus if you have an order with combined shipping and one of the tiers is marked as being in slab, the other tiers still need to be graded. Your order is all together in one box. The modern graders have graded those books and passed them on to the vintage graders. As soon as those books are graded all the tiers will show as being in slab. Ahh, makes sense. As always, thanks for the info! Thank you for info. Submitted 6 books all with pressing. 2 books under Expanded, 4 books under Modern. All of them on the same order number. All of the books show processing and recieved since June 22. One, golden age pressed, signature series submitted at Tampa Bay MegaCon September...22nd (con was 21-23). Just got the notice it's available for pickup at the Clearwater remote pick-up office. Thanks for the info. Hope that means Baltimore books are coming up in the pipeline. Just curious if anyone knows. I submitted some books back in early September and have not received anything yet. I thought turnaround time was 12 weeks or so. Well it’s been almost 5 months now. Is this common for grading because Cgc doesn’t take anywhere that kind of time? If so this will be the last time submitting any books. Long story. Basically they merged with Beckett Media and due to the move to Dallas and not all the staff making the move, leaving CBCS with a shortage of graders that combined with a previous hurricane disaster, apparently caused the TAT to be severely affected to the current 20 odd weeks. Would anyone be able to provide an update on batch number 18-24C6858? This batch was sent on May 6th, 2018 and tagged as received by CBCS on July 2nd, 2018. Have tried calling and emails with absolutely no response. I have to admit, nine months from the time my shipment was mailed with absolutely no updates is starting to get a little frustrating. Are they being pressed or signature verification? One of them includes signature verification. @Corsec signature verification does slow things up a little. Currently TATs are just over 5 months for normal orders, not entirely sure how verification would add to this, but 7-8 months does seem out of the ordinary. I understand the delays with the move and how things can take more time based on signatures, but this turn around is really poor even with the negative conditions they've been working with. The owner of my local shop hasn't gotten responses to emails, has not received a call back from his voice mails, and I have not gotten any responses either. This is literally the only avenue I can see that's left in an effort to try to get an update. @Corsec my order with pressing and witnessed signatures took 8 months. Now i dont submit that often but i have waited that long with cgc before, pretty sure cbcs will get their stuff organized...they better..i might hand off 6-8 books this weekend at a convention! @Themaxx35 Signature verification has a negligible effect on turnaroumd times. Do you really feel that this is an acceptable TAT? Disagree. My one day grading order was delayed 3 weeks because of signature verification. Or at least that was the reason given. Is this something you can help with @SteveRicketts or @TimBildhauser ? @Corsec The submission was not placed by you, so nobody at CBCS can discuss details about it with you. Customer Service has been in contact with the person who did the submission. Thanks for the info, I submitted a dozen or so books at the same con, mine finally switched to "grading", I've never done this before so the TAT doesn't really matter to me, the other company local to me in Sarasota still hasnt responded to an email from 2 years ago, so i think I'm doing just fine here. Submitted at the end of September from Tampa Mega Con. Pressing. Just picked up today. However...I just noticed that both side edges "squeak" and on closer examination; they're basically unsealed. Both side edges. Uh, is this normal? What do I do next? In addition, I signed that I had picked up the comic. Then, I looked more closely at the piece of paper and it says I owe $58.00. First, the submission form I filled out said $40 and they told me shipping is free if I pick-up at the Clearwater location which I did (it says $23.00 for shipping). Regardless, they already charged me the $40 that was on my submission paperwork. And since they screwed up setting up my account, I can't actually access the account associated with my submission to see if I have a balance. I love CBCS holders, but everything about this experience from a customer support/quality angle has been completely unacceptable. So, it looks good, but my account is messed up...I'm being charged differently than promised, and my comic is unsealed. 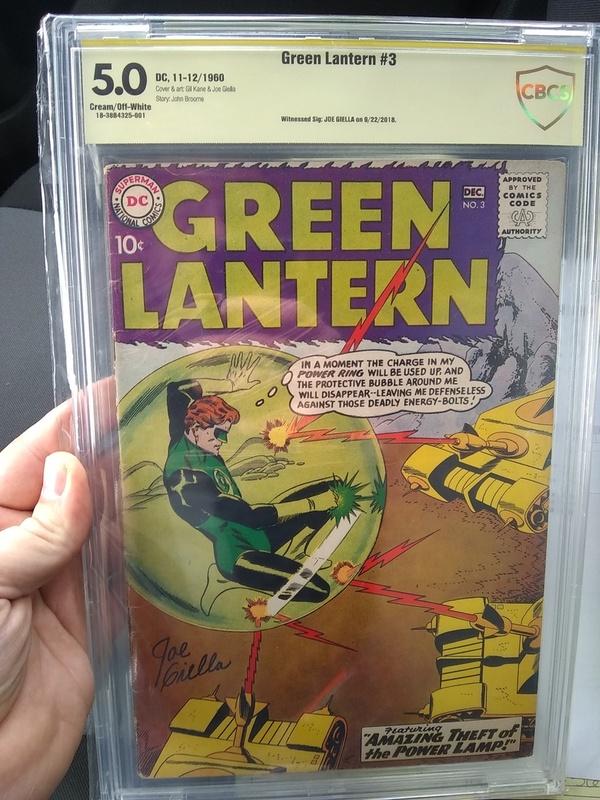 Cbcs slabs are not sealed all the way around. Others on the forum know more than I do about why that’s a good thing. But to your point, nothing’s wrong with the slab. Can’t speak to anything else. Sweet...never noticed this before. I only have 3 CBCS comics and this is my first submission. @etapi65 was Tampa Megacon Sept 21-23? Just wondering so I can figure out when my should be coming back. 1) The slabs aren't sealed along the side, that's normal. 2) If you owed a balance it wouldn't have been shipped or been able to be picked up. mrelowe; I'm very happy with the book. The process was a bit of a mess. cseale0223; yes, and mine was submitted on the 22nd of September so about 20 weeks to get it back. Honestly, it all turned out just fine. But man was it a hassle. I really want to submit another 25-30 books to CBCS. I just had issues from start to finish on the CBCS organizational side from start to finish. Was not a great first impression. My order from June 28 with pressing has more movement. The moderns went from recieved to labels last Wednesday and today the expanded books moved from received to grading. They still say received on the invoice though. If I did the math right I'll be at 22 weeks this Friday with no movement.